Average 3.81/5 out of 32 total votes. 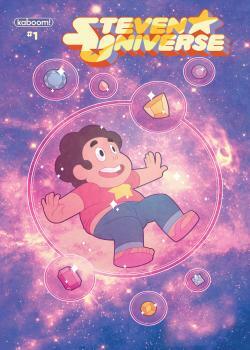 We're bringing Steven Universe back to comic books with more Steven, more gems, and more of the characters we all love in an all-new ongoing series! Writer Melanie Gillman (As the Crow Flies) and artist Katy Farina (The Amazing World of Gumball) are teaming up for the start of a new adventure for the entire gang. Based on Cartoon Network's Emmy Award-nominated animated series created by Rebecca Sugar about a boy with magical powers who goes on adventures with The Crystal Gems, a team of beings who safeguard the universe. The show is approaching its fourth season and has earned over 32 million fans of all ages worldwide.